Reid Epstein’s Wall Street Journal piece, Beto O’Rourke’s Past GOP Ties Could Complicate Primary Run, pointed out that “Before becoming a rising star in the Democratic Party, Beto O’Rourke relied on a core group of business-minded Republicans in his Texas hometown to launch and sustain his political career.To win their backing, Mr. O’Rourke opposed Obamacare, voted against Nancy Pelosi as the House Democratic leader and called for a raise in the Social Security eligibility age.” Surprised? You should have been reading DWT. Late last year we reported that Beto’s dad was a kind of switchy-changey politician– sometimes a Democrat, sometimes a Republican and when Beto and two of his pals– collectively “The Progressives”– decided to run for El Paso City Council it was on a very non-partisan agenda– improving urban planning, downtown development, border reform, creating a more diversified economy with more highly skilled jobs,and ending systemic corruption among city’s political class…” Beto won big and was reelected bigger and he turned out to be a dream official… for gentrification and for developers. 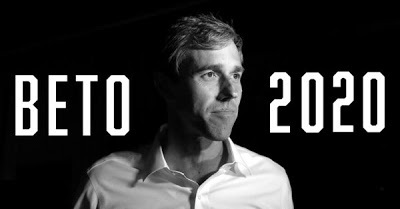 Beto’s biggest single contributor that cycle was the Hunt Companies (developers) who in 2012 gave massively to Republicans and… Beto– Texas Conservative Fund ($225,000), NRSC ($217,300), Mitt Romney ($33,250), RNC ($31,110), Ted Cruz ($25,500) David Dewhurst ($20,000), NRCC ($19,100)… only Republicans plus Beto. Worth mentioning is that they kept right on supporting Beto. In the 2016 cycle, for example, as they were writing over $2.1 million in checks to Jeb Bush’s campaign and over $200,000 each to the RNC and the NRCC, they also supported one Democrat– Beto– with $39,300. In 2014 they backed candidates like Bill Cassidy (R-LA), John Boehner (R-OH), Ed Gillespie (R-VA), John Cornyn (R-TX), Mitt Romney (R-UT) and one Democrat– Beto, who got more than any of them. Blue America didn’t endorse Beto for his reelection bids in 2014 or 2016 for two reasons. He didn’t need our help and he had turned out to be a so-so member of Congress, scoring an “F” from ProgressivePunch and joining the New Dems. Still, he has been good on some issues– immigration, gun control, campaign finance reform, Palestine, anti-trust and marijuana but usually in a “moderate” way. His environmental record is good, but he isn’t exactly the kind of guy to sign onto the GreenNewDeal. Nor Medicare-For-All. He’s more a centrist than an actual progressive. Last summer, NPR referred to him as “an unapologetic, unabashed liberal who has shown no interest in moving toward the political middle after his victory in the Texas Democratic primary. On issues like universal health care, an assault weapons ban, abortion rights and a higher minimum wage, O’Rourke has staked out progressive positions.” They quoted Democratic populist Jim Hightower saying “You’ve got a Democratic constituency that is fed up, not just with Trump, but with the centrist, mealy-mouthed, do-nothing Democratic establishment. 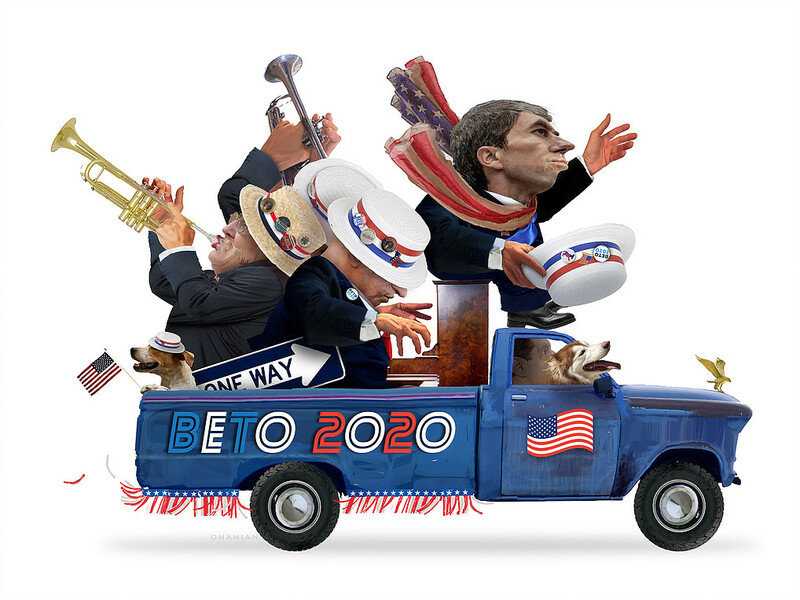 They’re looking for some real change and Beto is representing that.” NPR was wrong and Hightower may have been as well– at least if he was buying into any kind of reality behind a Democratic constituency that is deluding itself into thinking Beto is representing substantive policy-oriented change. The kind of change Beto represents is changing out a Cruz or a Trump for a Beto. That’s change– good change… but that’s not the Kind of change Bernie or Elizabeth Warren represents. Elaina Plott, writing for The Atlantic was less starry-eyed, noting that Beto has been endlessly compared to the great charismatic stars of the Democratic Party like JFK and Obama but she sees him more like Marco Rubio, “a young, handsome, eloquent, prolific fund-raiser.” But even Plott claimed he supported Medicare-for-All, which he certainly didn’t. 124 House Dems co-sponsored the Conyers bill while Beto was still in Congress– but he didn’t. Even some Texas Democrats considerably to his right like Gene Green and Marc Veasey and Blue Dogs Filemon Vela and Vicente Gonzalez signed on. When I spoke with him about it personally, he remained non-committal, the same way the website for his Senate campaign was. Will he be the guy to push for Job Guarantee? No. Free state colleges? No. Bernie and Bobby Scott introduced H.R. 15, the raise the wage act (for a $15 minimum wage) on May 25, 2017. There were 151 immediate co-sponsors. But Beto wasn’t among them. In fact, it wasn’t until February of 2018 that he finally signed on, one of the last 3 Democratic holdouts. In 2016, Beto endorsed Hillary, not Bernie. People call her a progressive as well. I’d say Beto is a moderate with more in common with centrists like Hillary and Biden than with cutting edge leaders like Bernie or Alexandria Ocasio. There are reasons he joined the New Dems but not the Congressional Progressive Caucus. In yesterday’s Christopher Hooks report for the American Prospect, Beto Versus The Bario, the point is that on the El Paso City Council Beto pushed through gentrification plans that benefited his rich Republican, predatory father-in-law, gentrification that was devastating to poor Latinos in El Paso. What has Beto actually done that people might like? Well, he gave a nice speech about Colin Kaepernick that a lot of people wanted to cast as bold, but was actually so bold that Nike employed the same tactic a few months later. He did some air drumming at a fast-food drive-thru. He skateboarded. He was in a punk band. He has lots of energy, he’s young-ish, he’s tall, he’s good-looking. …On a policy level, he’s one of the most conservative Democrats in the field. He doesn’t concretely support Medicare for All, except in some “it would be great, eventually!” sense. He voted against free public college. He makes vague noises about liking the Green New Deal without signing on. He gets money from oil and gas executives, and thus he won’t take a hard position against fossil fuels. He folded on the Israel Iron Dome question under the slightest pressure, he voted to let Obama negotiate the Trans-Pacific Partnership (which cost him the AFL-CIO endorsement in his race against Cruz), and the sheer amount of awful Republican bills he’s supported is enough to fill an entire article. He’s good enough at what he does that he’s going to make other people believe that, too– the most gullible, the most naive, the most vapid. Let’s return to a key word: The premise of his campaign is the premise of transcendence. He’s the comic book hero that many liberals have been waiting for, the man who will return us to the golden days of Obama and erase the nightmare that was Trump. He’s the savior, and because he’s the savior, he only asks for our most superficial support. He doesn’t need a grassroots movement that extends beyond the ballot box, he doesn’t need a political revolution at his back, and he doesn’t need to be anything more than a viral superstar who captures our hearts for the duration of the campaign season.